If you are searching for sugar cane based paper products that are environmentally friendly, Green Cleaning Products can help you. Green janitorial supplies available from Green Cleaning Products include environmentally friendly commercial cleaners and products made from recycled materials. Industrial strength green cleaning products in sustainable packaging and green janitorial supplies are also available. Selecting products made from recycled fibers reduces the need for virgin wood pulp, which means more trees are left standing. The principal raw material used for manufacturing paper pulp is wood. However, growing demand in the paper industry, at a time of dwindling forest resources, has compelled manufacturers to turn to other sources of raw materials, such as cereal straw, reeds, bamboo or sugar cane bagasse. For centuries paper was a rare and precious commodity handmade mostly from linen and cotton rags. Today, it is a fundamental part of life and its existence is taken for granted. Each year the world produces and consumes more than 300 million tons of paper. For every ton produced, two to four tons of trees are brought to the mill! This is of critical concern because forests are being destroyed at an unsustainable pace. Deforestation accounts for 20 percent of all greenhouse gas emissions worldwide, exceeding even the global transportation sector. Our consumption is wasteful. According to World Watch magazine, the equivalent of almost 270,000 trees is either flushed or dumped in landfills EVERY DAY worldwide, and roughly 10 percent of that total is attributable to toilet paper. A great reason to seek green janitorial supplies. Today, tree made paper accounts for over 90 percent of the world’s production. Fortunately alternatives are available. Around 5 to 10 percent of the global production is produced from agricultural crops. Second only to electricity cogeneration, paper production is the second-largest revenue stream from sugar cane bagasse. Sugar cane bagasse is one of the most environmentally friendly, sustainable, renewable resources suitable for high quality paper making. 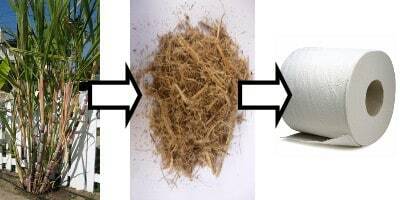 Sugar cane waste, known as bagasse, is like our lawn clippings. It is a recycled fiber made from the residues of an annual agricultural crop byproduct, thus has no impact on our forests. It is fully recyclable, compostable as well as biodegradable, like many of the green cleaning products we supply. The paper industry absorbs 10 percent of the world’s bagasse production. This material offers several advantages: rapid growth of the sugar cane plant, widespread cultivation, fewer pesticides for growing sugar cane, as well as lower energy and bleaching chemical requirements for bagasse refining than for the manufacture tree based products. Such a process is also a convenient means of usefully clearing this voluminous sugar refinery waste product: indeed, one ton of refined sugar results in two tons of bagasse. Sugar cane is grown and used extensively around the world. When the sugar cane is mature, the stalks are harvested and sent to a sugar mill at which time the sugar is extracted from the fiber. The sugar is then used for human consumption and the fibrous residue or pulp remains after the stalks are crushed for extraction of juice. This pulp is then available as a biofuel or as a renewable resource in the manufacture of paper. The high moisture content of bagasse, typically 40 to 50 percent, is detrimental to its use as a fuel. For paper production, however, it is normally stored wet in order to assist in removal of the short pith fibers, which impede the papermaking process, as well as to remove any remaining sugar. Using sugar cane bagasse in new products such as toilet paper, tissue, towels and other green janitorial supplies reclaims the large volume of agricultural waste material and prevents additional environmental harm from the polluting greenhouse gases created during bagasse’s historical disposal method of burning. As the sugar cane fiber is grown primarily for sugar and the fiber is retrieved (rather than disposed of) sugar cane bagasse pulp products are preferable to wood pulp products. As an alternative fiber, products are produced from a non-forest resource. Crops are renewed in less than a year for sugar consumption ensuring a nearly endless supply of renewable resources. Using agricultural crops rather than wood has the advantage of reducing deforestation, as forests are often burned to allow for the production of agriculture. Sugar cane bagasse helps to leave forests intact which preserves the environment for indigenous flora and fauna ecosystems and reduces global warming. While tree farms create an ongoing supply of virgin pulp and fiber, it takes more time to reach maturity which consumes tremendous amounts of chemical pesticides and fertilizers and soaks up large quantities of water. End product exceeds environmental parameters set forth by Forest Stewardship Council (FSC), Sustainable Forestry Initiative (SFI) and other prominent forest management organizations. Wood pulp based products can only be recycled a limited number of times due to the degradation of the fibers during the recycling process. This issue is already clearly apparent in the carton and packaging industries. Due to the ease with which bagasse can be chemically pulped, bagasse requires less bleaching chemicals than wood pulp to achieve a bright, white end product. Bagasse requires fewer greenhouse gases to collect compared to harvesting of wood chips since it is already at the factory. Paper exceeds Federal and State government environmental mandates. Sugar cane bagasse fibers are well suited for tissue, corrugated cardboard, newsprint, and copy and writing paper. Like our green cleaning products, recycled products manufactured from renewable resources are sustainable. Sugar cane bagasse based products are not only tree free, they are also recyclable, 100 percent biodegradable and fully compostable. When composting the end products biodegrade back into the soil without leaving any harmful residues and all of this from the residue of an annually renewable resource, sugar cane, which is grown for food. As a consumer you now have a choice about whether to use tree made or tree less paper. Green Cleaning Products has products manufactured from sugar cane bagasse, including toilet paper, tissue, and towels, available.